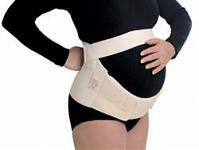 CMO Mother-To-Be by anatech is used to provide maternity support. This support has brought relief to many women and is recommended by most of the doctors. Made in soft Latex free elastic to provide firm support to the users. Velcro straps are used to adjust based on the comfort needed by the user. Doctors proved it to be safe and useful.